Atrazine, a controversial herbicide introduced to agriculture in the 1950s, has been banned in the European Union but is widely used in the United States and Australia. In the decades that atrazine has been accumulating in agricultural fields, some bacteria in those soils have evolved the ability to take advantage of this nitrogen-rich compound, metabolizing it and using it to grow. Researchers at the Commonwealth Scientific and Industrial Research Organization of Australia, or CSIRO, are interested in harnessing the bacterial ability to degrade atrazine in order to remediate atrazine-polluted environments. In a new research paper published in the Journal of Biological Chemistry, a team from CSIRO and Australian National University describe previously unknown proteins involved in atrazine degradation – and the insights that these can give us into how bacteria evolve new abilities in response to chemicals synthesized by humans. "Bacteria are really good at evolving to be able to exploit new nutrient sources, and they do this by adapting existing cellular machinery for novel functions," said Colin Scott, the leader of the Biocatalysis and Synthetic Biology Team at CSIRO, who oversaw the work. Turning atrazine into a usable nitrogen source is a multistep process for bacteria, involving multiple enzymes. Each of these enzymes had previously served different functions in bacterial cells in the world before widespread atrazine pollution. In atrazine-degrading bacteria, the genes encoding these enzymes are grouped on a section of DNA called a plasmid, which can easily be passed between bacteria, giving them a ready-made new adaptation. "Within 10 years from its original discovery (in the 1990s), genes from this pathway were found (in bacteria) on pretty much every continent except Antarctica," Scott said. In other words, as atrazine use spread across the globe, so did the bacterial ability to metabolize it. 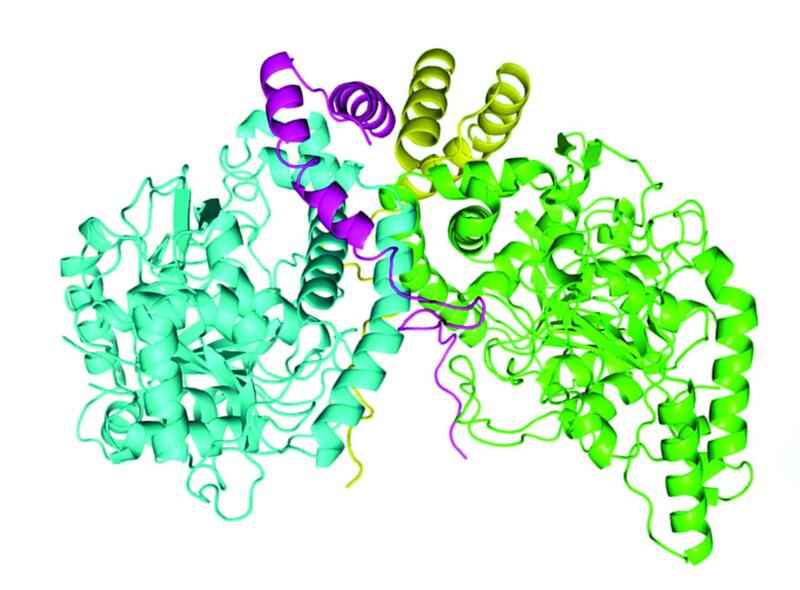 Whereas the enzymes involved in several of these steps have been thoroughly described, the structure of one of them, called AztE, was still unknown. AztE is crucial for converting a cyanuric acid – an intermediate step in the atrazine degradation process – into ammonia. Lygie Esquirol, a PhD student in Scott's lab, led the effort to purify this protein. When the team examined the protein, it found something surprising: another, very small protein, the existence of which had not been predicted from the bacterium's genome sequence, forming a complex with AztE. This new protein, which the team named AztG, seemed to be necessary to stabilize the structure of AztE. Together, the structure of AztE and AztG resembled a different bacterial protein complex – the transamidasome, which helps make bacterial transfer RNA. Thus, it appeared that proteins involved in the basic functions of the bacterial cell were re-tooled for the new atrazine pathway. "(The transamidasome) is absolutely essential for bacteria in the way that they make their tRNAs," Scott said. "It was somewhat surprising that our protein, which is involved in pesticide catabolism, was (similar) to this protein complex that's used in central metabolism." The promise of synthetic biology is that humans can combine genes encoding different functions in an organism in creative ways. However, although it's relatively simple to insert genes into new contexts, there is not always a guarantee that a newly constructed pathway will work as intended. It's therefore instructive to examine pathways like the atrazine degradation pathway, in which bacteria have successfully repurposed a series of unrelated genes to do something new. "This (pathway) has come from other places and been cobbled together, but there must be some underlying rules and constraints about how to do that," Scott said. "We don't know at the moment what the design rules are for complex pathways in terms of their genetic architecture. What we want to do is to use the cyanuric acid pathway as a model to understand some of those design principles." Atrazine-degrading bacteria convert atrazine into nitrogenous compounds that plants could potentially use as fertilizer, but this poses its own problems: Nitrogen runoff into water causes algal blooms and animal die-offs. Thus, the one of the key problems that CSIRO researchers are trying to solve is how to contain the reaction so that it occurs only where and how humans need it. One approach is to use targeted application of enzymes purified from these bacteria, rather than the bacteria themselves. "As a technology, we've gone out to the field and proven that (the enzymes) can work," Scott said. "The next step is working with industry to try to implement some of these solutions." The study was funded by the Australian National University and CSIRO.